Today in Masonic History Miles Gilbert "Tim" Horton is born in 1930. 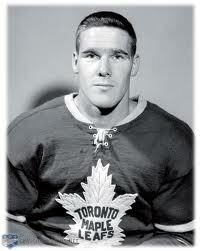 Miles Gilbert "Tim" Horton was a Canadian hockey player and businessman. Horton was born in Cochrane, Ontario on January 12, 1930. He had one brother Gerry. Horton grew up playing hockey. At the age of 18 the Toronto Maple Leafs organization signed him and he began playing Junior Hockey in Toronto. In Toronto, Horton attended St. Michael's College School a Catholic educational institution famed for the number of NHL players it has produced. Two years later Horton was playing professional hockey on the Maple Leafs farm team, the Pittsburgh Hornets a part of the American Hockey League. Horton in 1950 appeared in a single NHL game. He wouldn't permanently join the Maple Leafs in the NHL until 1952. He remained with the Maple Leafs until 1970. In 1955 Horton received severe injuries during a game when he was checked into the boards. He suffered a broken leg and a broken jaw. The injuries were so severe that many doubted Horton would return to professional hockey. The critics were proven wrong when in the 1960's Horton set the team record for most consecutive games by a defenceman. From 1961 to 1968 Horton appeared in 486 consecutive games. With the Leafs, Horton helped win 4 Stanley Cups and appeared in 7 all star games. Horton went on to play for the New York Rangers, Pittsburgh Penguins and Buffalo Sabres. He was with the Sabres until his death in 1974. In 1964 Horton opened his first Tim Horton Doughnut Shop in Hamilton, Ontario. By 1967 Tim Horton Doughnut Shop had become a multi-million dollar franchise. Horton also owned a hamburger restaurant and a Studebaker dealership. In February 21st, 1974 Horton was in Toronto with the Sabres to play the Maple Leafs, a game the Sabres lost. On Horton's late night drive back to Buffalo, he stopped at the franchises Oakville office. There he met with his partner Ron Joyce and the two called Horton's brother Gerry. Both Ron and Gerry could tell that Horton was intoxicated and both men asked him to stay where he was, he refused and continued his drive to Buffalo. Horton lost control of his vehicle and was ejected from the vehicle. He was pronounced dead at a local hospital. Autopsy results at the time were not released. In 2005 the autopsy and other information was released. In the report it stated that Horton had twice the legal limits of alcohol as well as various stimulants in his system. Horton was a member of Kroy Lodge No. 676 in Toronto, Ontario.